Only 26 years old, it is hard to believe that 2018 will see John Edwards complete his 14th season in motorsports. 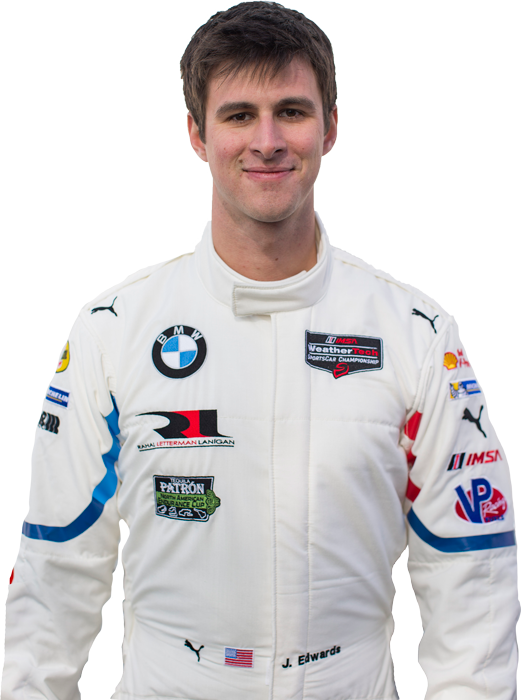 A BMW Team RLL driver since joining BMW on a part time basis in 2013, John has supplemented his IMSA seasons with races at the Nurburgring in Germany and, in 2016, tested a BMW M4 DTM racing car in Jerez, Spain. John Edwards does not like to waste time. While that’s certainly a pre-requisite for any race car driver, John has taken it to the next level. Proof? In 2004, he won a round of the Skip Barber Series at age 12, making him the youngest winner of a single-seater race at the time. Racing in Europe in 2005 and 2006, he became the youngest driver ever to receive a FIA racing license. In 2013, he drove the Z4 GTLM to victory at Lime Rock Park in what was only his third race in a partial season with BMW Team RLL. Now in his sixth year with BMW and his fifth complete season, John has become a most accomplished endurance driver, earning pole positions, podium finishes and victories for BMW.